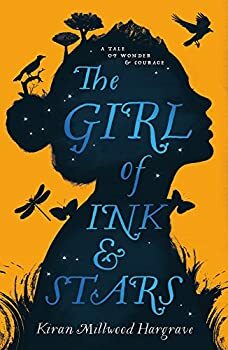 The Girl of Ink and Stars (2016; published in the U.S. as The Cartographer’s Daughter) is Kiran Millwood Hargrave's debut novel. It tells the story of Isabella, a girl of 13, who lives with her father (Da) and her chicken (Miss La) on the island of Joya. Though Da was once a cartographer who travelled the globe making maps, Joya is now under the control of the despotic Governor Adori and all travel is forbidden. What's more, only part of the island is accessible while the "Forbidden Territories" are cut-off by forest and populated by the "banished". Isabella and her Da can only connect to the outside world through the exquisite maps for which they share a passion, passed down from father to daughter.